Due to its location in the ‘Pacific Ring of Fire”, Indonesia is frequently prone to natural disasters. Therefore, Indonesian nurses need to have the ability to assist in disaster situations as they are considered an important element of the workforce in disaster preparedness and response. However, the current nursing curricula in Indonesia does not adequately prepare nurses to respond in these situations. 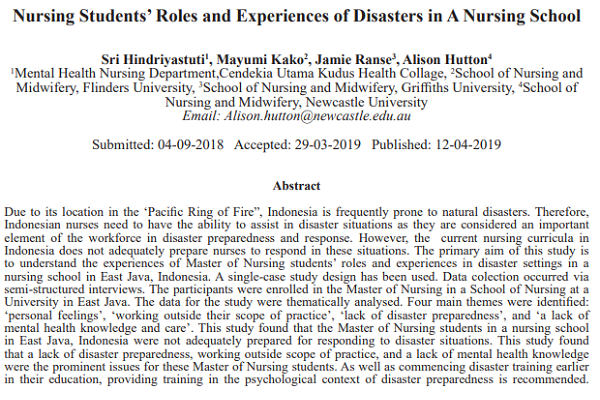 The primary aim of this study is to understand the experiences of Master of Nursing students’ roles and experiences in disaster settings in a nursing school in East Java, Indonesia. A single-case study design has been used. Data colection occurred via semi-structured interviews. The participants were enrolled in the Master of Nursing in a School of Nursing at a University in East Java. The data for the study were thematically analysed. Four main themes were identified: ‘personal feelings’, ‘working outside their scope of practice’, ‘lack of disaster preparedness’, and ‘a lack of mental health knowledge and care’. 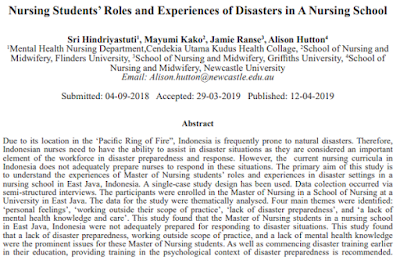 This study found that the Master of Nursing students in a nursing school in East Java, Indonesia were not adequately prepared for responding to disaster situations. This study found that a lack of disaster preparedness, working outside scope of practice, and a lack of mental health knowledge were the prominent issues for these Master of Nursing students. As well as commencing disaster training earlier in their education, providing training in the psychological context of disaster preparedness is recommended.